IFA, one of the largest electronics shows in the world has finished. To mark the official beginning of IFA 2014, Samsung Electronics’ President and CEO, BK Yoon, delivered a keynote speech. In this speech, Samsung Electronics, one of the leading electronics companies worldwide, presented Smart Home as the next big thing of the electronics market. Smart Home is a service that creates an interactive environment where all your devices at home are connected, to help the customers use the products more easily and conveniently. 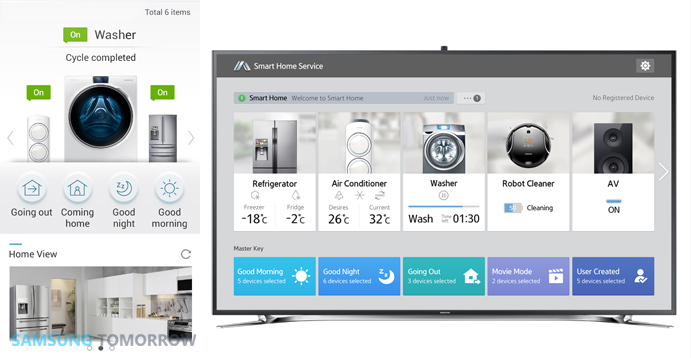 Users can control all of home appliances including refrigerators, washing machines, air conditioners, and robot cleaner through an integrated application installed in your smartphone, smart TV or gear devices. Samsung Smart Home had been introduced at the international events including IFA 2013 and CES 2014. 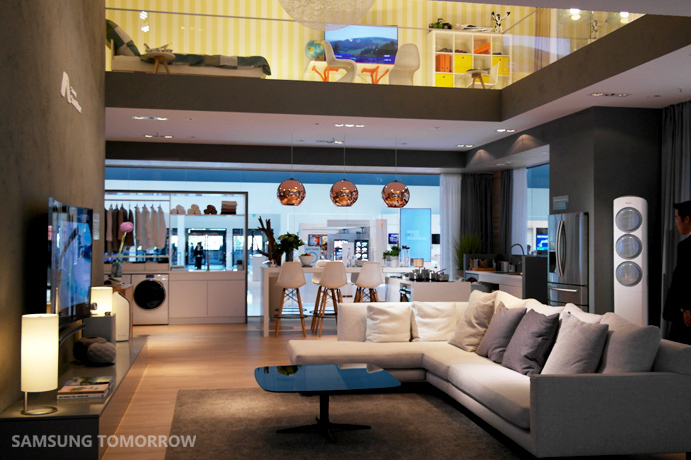 However, at IFA 2014, Samsung has definitely highlighted Smart Home more than ever. It placed Smart Home booth in the very center of the exhibition while featuring new and much enhanced functionalities. Samsung’s Smart Home booth at IFA 2014 featured various solutions including four new core functionalities including voice control, energy management, safety service, and location recognition. While previously developed features were mostly concentrated on device control, these four had been designed with great emphasis on enhancing user convenience. • Energy Management: According to consumer research, the needs of cost savings were high on the priority. This service enables users to check the amount of electricity used of connected devices and the expected cost of the energy consumption. (*Electricity bill can be charged differently by countries and it is planned to be applied.) Users can monitor their electricity usage by devices, and daily or monthly as well. Through mobile app and Smart TV app, you can use this functionality whether indoor and outdoor. • Voice Recognition Control: If you connect Galaxy smartphones and Galaxy Gears with your home appliances, you can operate the appliances such as air conditioners and lamps through your voice. Through the ‘S Voice’ functionality embedded in the Gear series and Galaxy smartphones, people can activate the home appliances via voice. Many detailed voice commands have been preloaded to let the user give specific instructions to devices. • Safety Service: When you are out of the house, you can still monitor the interior of the home. Safety Service connects digital door locks and IP cameras in order for users to check who is entering and exiting their home. If it detects anything, alarms are sent to smartphones of the family members. • Location Awareness: The location awareness technology makes the home appliances automatically turn on according to user’s location from home. For example, when user approaches the home, a lamp, a robot cleaner, and an air-conditioner start operating to prepare a pleasant environment. The integrated application is the key of Smart Home services. Through this app, smartphones, Smart TVs, and Gear devices can play a role of Smart Home controllers. Prospective users of Smart Home are people in various countries in all ages. Therefore, UX designers tried to make it easy to use and offer a seamless using experience. To simplify the home screen, designers selected frequently used functionalities and located them on the upper side of the home screen. While most of existing home appliances are controlled respectively in each device, the integrated app gives a new concept of service that connects and integrates multiple devices. UX designers from various product departments set some of ‘using scenarios’ that consist of different devices needed at the same situation and the ‘Master Key‘ was created. For example, if you select ‘Movie Mode‘, it automatically operates some devices, – for example, the lamp lights go dimmed and audio devices change the settings, – to make an optimized environment for movie watching. Since the integrated app deals with the full spectrum of home appliances, it was essential to cooperate with diverse departments. UX designers from different departments including Digital Appliances, Visual Display, and UX Center spent considerable time in shaping the same UX identity of the app. For designing Energy Management service, for example, they tried to make graphs and figures look simple and seamless with intuitive design and even had to check if the figures were displayed with same font and whether to place a decimal point or not. Likewise, Samsung Smart Home was born by constant care to offer seamless and convenient using experience, and these efforts are still being made as well. Smartphones have changed our lifestyle by ‘mobile innovation’. From Smart Home services, another great change is expected yet probably in another way. By integrating all devices at home, Smart Home will not only enhance functional effectiveness but also add new values to our lives, based on understandings of our daily lives.